The battle against the gasoline industry's toxic pollution was a victory for the public and its right to know what's in the air they breathe. How the movement to fight for clean air in Oregon was born. The oil industry has become the largest source of unabated air pollution in the Portland area. On certain days, as many as seven oil companies unload gasoline from barges into storage tanks at their docks that line the Willamette River in Northwest Portland. The tanks in that area contain about 300 million gallons of gasoline, which represents almost all of the state of Oregon’s gasoline supply. And when the barges disgorge their contents, residents of nearby neighborhoods might as well be living next to the belching smokestacks of an oil refinery. Gasoline vapors typically build up inside the barges during their journey from oil refineries in Puget Sound or the San Francisco Bay Area. When they are unloaded, these fumes escape to the outside air. The amounts that escape are surprisingly massive, and overall emissions can multiply on days when more than one barge is unloaded. The fumes are dangerous, yet only one of seven docks are fitted with air pollution controls of any kind. And when the barges pollute, the do so without air contamination discharge permits. Now the Oregon Department of Environmental Quality, which has the job of issuing federal air pollution permits in Oregon, is proposing to issue permits that would, for the first time, legalize the emissions. The DEQ would even allow five of the gasoline companies to increase their emissions by 100 tons per year, despite an order issued last year by the US Environmental Protection Agency that they decrease emissions by 20 percent. In recent years, pollution from the gasoline terminals has contributed to Portland’s periodic failures to comply with federal standards for smog, also known as ground-level ozone. The EPA says even small exposures to smog can aggravate asthma or reduce immune defenses. Repeated exposures over several months can cause permanent structural damage to the lungs. Prevailing summertime winds push the fumes primarily toward the low-income and ethnically diverse neighborhoods of North and Northeast Portland. Last year, the EPA tightened ozone standards, saying the old rules were not strong enough to prevent serious health effects. After decades of enduring bad air in Portland, in 1997 the city barely complied with the old, weaker standard. The city’s compliance meant that it could relax some regulations by, for example, lifting a parking lid in the central city. It is not clear how the city will comply with the new tougher standard, however. When the gasoline companies’ new permits go into effect, they will legalize air emissions at the barges. What’s far from clear is the legality of current and past emissions. The lion’s share of these emissions have never been permitted by the DEQ, which essentially ignored them. The DEQ and the oil companies insisted the emissions violated no law, but the EPA is not persuaded. It has launched an investigation. Meanwhile, members of the public have been kept in the dark about the barges’ air emissions. At the oil industry’s request, the DEQ has been storing their emission records in “confidential” files. In March, the DEQ refused to allow Cascadia Times to inspect the files. But the newspaper pursued the information by appealing to Oregon Attorney General Hardy Myers. In April, Myers ordered the DEQ to release the files to Cascadia Times, saying the public has the right to know what’s in the air that people breathe. Such information, the order stated, is “not subject to any confidentiality provision of state or federal law.” By keeping the information secret, Myers continued, the DEQ was acting contrary to the “right-to-know” provisions of the Clean Air Act as well as the agency’s own public disclosure rules. The specific damage caused to the health of Portlanders from breathing these gasoline vapors are largely unknown and may be hard to document. However, numerous residents of neighborhoods near the gasoline terminals have complained about the smell. And in Northwest Portland, residents frustrated by emissions coming from the nearby industrial zone where the gasoline terminals are located went so far as to obtain an EPA grant to monitor air contamination on their own. Among other things, results showed elevated levels of benzene, a carcinogen and one of the most hazardous components of gasoline. The monitoring also detected the presence of methyl tert-butyl-ether, the anti-knock additive that Chevron adds to its gasoline. The EPA says the health risk of exposure to this chemical is not known, but it has been banned for health reasons in Fairbanks, Alaska, and is controversial in California. In the weeks since the DEQ released the gasoline industry’s pollution records, Cascadia Times has examined thousands of pages of documents. Some of them are 25 years old, and most have never been available for public review until now. Seven oil companies – ARCO, Texaco, Tosco, Chevron, Time, Mobil and GATX – operate bulk gasoline terminals and docks in Northwest Portland, where they load fuel onto barges and tanker trucks, or into storage tanks and pipelines. Gasoline is a highly volatile chemical composed of hundreds of toxic substances. Most are VOCs, or volatile organic compounds, with a great tendency to evaporate, and never greater than on hot days. Fumes from tanker trucks and pipelines are tightly regulated, but all barge emissions escape regulation by the DEQ. Oil companies import gasoline to the Portland terminals from refineries in Puget Sound and the San Francisco Bay Area by pipelines, barges and ocean going tankers. These ships travel up the Columbia River to Portland as well as ports all the way to Eastern Washington. Each barge carries up to 2.5 million gallons of petroleum products, and a single off-loading on a hot day can release as many as 10,000 gallons, or 5 tons, of vapor into the air. Two off-loadings a day can release 10 tons, and so on. By comparison, the four oil refineries in Martinez, Calif., an air pollution toxic hot spot on the east side of the Bay Area, release an average of 9 tons of VOCs daily, EPA records show. In addition to polluting the air while in dock, the barges also vent fumes while traveling. Gasoline shipments up the Columbia River have tripled in the last nine years. As shipments increase, so does the amount of air pollution emitted, and there are no limits on the number of shipments allowed. In an early draft of the air pollution permits, the DEQ proposed to establish an hourly emissions limit, but withdrew the proposal at the request of the gasoline companies. Instead, the DEQ established a monthly cap on emissions. The DEQ has made no effort to analyze the cumulative impacts of the gasoline terminals’ emissions. Unlike Washington and California, Oregon law does not require any environmental impact analysis of government decisions. When Cascadia Times first requested access to the gasoline terminals’ pollution records, it found the documents missing from the files. In the place, the DEQ inserted red sheets of paper as placeholders for the missing documents. Each of the seven gasoline companies has an air pollution permit that specifically exempt barge loading and off-loading from regulation. Of the seven, the biggest polluter is Chevron. Its emissions of VOCs increased from 17 tons in 1986 to 336 tons in 1997 – a 20-fold increase in pollution in just a decade. Chevron, in a 1990 application for a new permit, provided wildly inaccurate information about its annual barge emissions, saying they amounted to just 9.3 tons. But other DEQ records show that the emissions ranged from 64 to 336 tons every year. Records show that the DEQ accepted, without raising questions, Chevron’s lowball statement about its emissions in its permit application. The permit was approved without controversy. 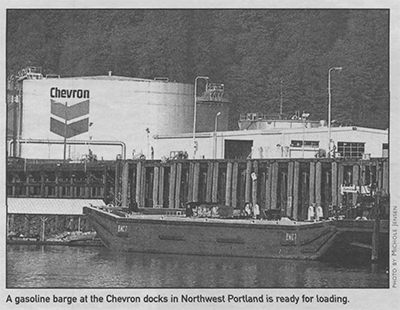 In 1993, the DEQ advised Chevron that it was drafting rules requiring emission controls on all barge loading and off-loading operations. However, in the face of resistance from the oil companies, the DEQ never issued those rules, and failed to require any barge emission limitations in their air pollution permits for another decade. Chevron’s current air pollution permit, which was issued in 1993, specifically forbids emissions “significantly” higher than the amount listed in Chevron’s permit application. That amount, you will remember, was 9.3 tons, and was exceeded in later years by a factor of up to 36 with impunity. DEQ officials say they cannot explain how or why Chevron was allowed to violate the permit without facing any enforcement action. Though most of Chevron’s emissions are not specifically allowed by a permit, Doug Hardesty, manager of air pollution programs in the EPA’s Seattle office, said they are not necessarily illegal. “If the emissions have significantly increased, they are subject to review,” he said. Hardesty said the EPA has the authority to veto the permits if they don’t comply with the Clean Air Act. The only way to verify whether the gasoline companies are in compliance with their permits is to compare them with data they report annually to the DEQ. These reports show how much gasoline the companies ship by barge, pipeline and truck, as well as a calculation of how much pollution these shipments release. The industry does not directly monitor its emissions. The companies objected to Cascadia Times’ request for these reports because they show how much fuel was shipped. The companies contend the amounts shipped is “confidential business information” and as such must not be disclosed by the DEQ. But without this information it would be impossible to know how much pollution the companies release. The amount of pollution released is based on a formula that takes into account the volume of fuel shipped multiplied by an emissions factor supplied by the EPA. In its petition to the Oregon Attorney General, Cascadia Times said the DEQ cannot lawfully withhold this information, because without it the public would never know how much pollution the companies are releasing or whether they are violating their air pollution permits. Shelley McIntyre, an assistant attorney general, agreed with us in a written response to our petition. “That is precisely the point of having that information available to the public. To verify the accuracy of reported emission calculations.” Emissions data must be made public if it is necessary to determine the identity, amount, frequency and concentration of the pollution, she said. But McIntyre said that by keeping the information confidential, the DEQ violated the Oregon Public Records Act, the DEQ’s own rules on confidentiality, and certain provisions of the federal Clean Air Act. The oil companies protested the Attorney General’s ruling, but only ARCO put its objections in writing, the DEQ said. But McIntyre said anyone, whether a reporter, busybody or scientific researcher, can have access to public records. As a result of her ruling, people who live downwind of the Northwest Portland terminals can finally find out what the gasoline industry has been dumping into their air. Lisa Jackson lives in North Portland directly downwind from the gasoline terminals, and often smells gasoline fumes. She says they give her headaches. A woman who lives nearby who did not want to be identified in this story says the fumes irritate her eyes and affect her vision. Some states, including Oregon, and some industry group are fighting to overturn the EPA’s civil rights rules. Residents of the neighborhoods downwind from the gasoline terminals hope data collected by a neighborhood association in Northwest Portland will help provide answers to their various health problems. They might be even more frustrated if the DEQ and the companies took their responsibility to protect the air seriously instead of hiding behind technicalities in federal regulations. The oil companies say that under those regulations, they don’t have to install air pollution control equipment at Portland’s barge loading facilities. They cite a 1995 EPA rule that requires only the nation’s 30 largest gasoline terminals to install the equipment, known as “vapor recovery units.” The industry successfully lobbied for a loophole that exempts smaller facilities from regulation. Individually, each Portland terminal is among the smaller exempt facilities. But if the law considered the cumulative impact of all seven terminals, they would easily qualify for the stiffer regulations. In fact, Portland would be among the five largest gasoline terminals in the country, according to an EPA database. The failure to control emissions from Portland’s gasoline terminals affects not only people who live nearby but people all over the Portland Metropolitan Area. That’s because the emissions are a major contributor to Portland’s smog, according to the DEQ. It says Portland has violated the federal ozone standard, which is designed to control smog, repeatedly over the last few years. In a 1980 planning document, the DEQ said that in order for the city to comply with federal smog regulations, the gasoline terminals had to limit their combined VOC emissions to 673 tons per year. Nevertheless, the terminals continued to exceed that limit and the city continued to violate the ozone standard. In 1992, the DEQ reported that the terminals’ emitted 2,000 tons of VOCs. A new plan approved by the EPA in 1997 calls for reducing the terminals’ emissions by 20 percent by 2006. The city’s air, meanwhile, continues to be riddled with smog in violation of the Clean Air Act. Under the act, a city can violate the smog standard on no more than three days every three years. But in July 1996 alone, Portland violated the smog standard three times. DEQ records show that Chevron transferred fuel at its terminal either on the day that smog violation occurred or on the preceding day. The DEQ’s strategy for addressing smog violations has been to ask the gasoline terminals to voluntarily halt or reduce operations on hot smoggy days. Greg Grunow, a DEQ air pollution specialist, said the new permits would replace the voluntary program with a regulation requiring them to curtail – though not necessarily stop – barge operations during ozone emergencies in the future. In the future, the DEQ believes that a new pipeline proposed in western Washington will meet Oregon’s gasoline demand, rendering barge deliveries unnecessary. The pipeline could also reduce the potential for spills in the Columbia River. Chevron is fighting the pipeline project in concert with the Columbia’s lone barge operator, Tidewater Barge Co. In July 1997, the EPA determined that Portland had finally complied with the federal ozone standard. But did it really? No one knows, and no one will ever know. During the summer of 1996, the DEQ lost 74 hours worth of data that were collected on the smoggiest days of the year. In July and August, the DEQ lost three consecutive days worth of ozone monitoring data because two ozone-measuring instruments in Milwaukie produced what the agency deemed were questionable readings. The DEQ said one machine was not calibrated correctly while the other simply failed. This is curious, because the machines are called on to produce ozone readings during only the three summer months, and are truly needed only on the hottest days when ozone readings tend to skyrocket. Spence Erickson, a DEQ air quality manager, said the agency had no choice but to discard the data because the machines failed to meet quality controls. If the readings had shown ozone violations for those days, as appears likely, the EPA would have been unlikely to determine that the city was in compliance with its ozone standard. Nevertheless, the DEQ claimed that it had met the standard and the EPA went along. DEQ records show that Chevron had been conducting its highly polluting fuel transfer operations on the very days that the data was lost. As a result, the DEQ was able to avoid Clean Air Act restrictions that would otherwise have been imposed by the EPA in response to the likely violations. Since 1997, the city has been celebrating its iffy clean air accomplishments. Parking restrictions that had been imposed by the EPA to control pollution in downtown have been lifted, and parking lots are opening up throughout the area.